We know the feeling — you’re practically ripping out your hair trying to figure out how to afford the perfect wedding. 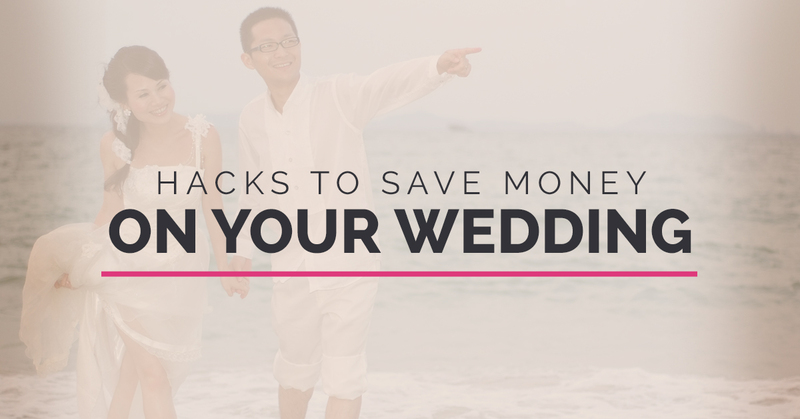 Sticking to a budget can seem impossible, especially when wedding costs accumulate. It can feel like your dreams of a day exactly how you want it are not going to come true. At Beach Weddings Alabama, we work with couples to make sure they get their perfect day and stay within their budget. On top of this, we have come up with some hacks for saving money on your big day, all while maintaining the vision you have for your dream wedding. In the wedding world, the day of choice for couples to get married is usually a Saturday. It’s not during the workweek, people from out of town can attend — it just works. However, because it’s such a popular day, it is expensive to book your wedding on that day. If you choose to book your day on another day, like Friday or Sunday, you’ll save significant bucks. Most couples have about a year-long engagement. Because this is what most people do, venues and vendors typically book up a significant amount of time in advance. To save major money, go for a two year-long engagement. That will give you time to get everything you want for your wedding day exactly as you want it. Not to mention the fact that you have time to research, and you can bank on things like two years worth of birthday money, holiday gifts, and tax returns to help cushion your budget. In the wedding world, there is a wedding season and a wedding off-season. Wedding season begins in late spring, around April, and ends in early fall, around September. 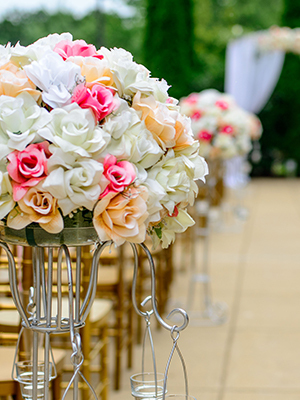 During wedding season, wedding venue prices significantly increase due to demand. The best time to get married to save money is right at the end of wedding off-season. This will give you the ideal weather conditions, all while being able to save a few bucks. If your loved ones are offering to help out with wedding preparation, take advantage of that! If you have a grandparent or relative that wants to make your cake, don’t say no! Instead of paying more for vendors that may not know exactly what you’re looking for, there are significant advantages to free labor, and labor done by people who love you and know you well. If you’re reading this blog and you’re a bride, you can save significantly on your dress. It is possible to wear the dress of your dreams without paying a fortune. An option to save money on a beautiful dress is to get it used. Used dresses are great because they’re significantly discounted and often have only been worn once. If you’re trying to stick to a budget, there are unnecessary details that won’t make a difference if you forgo them. Personalized napkins or elaborate place settings may not be totally necessary if it’s getting in the way of other details like photography and food. Your wedding venue is a crucial detail that impacts so many other aspects of your wedding. When booking a venue on a budget, you’ll want one that is beautiful naturally and doesn’t need much decor. It’s also a great money-saver to choose a venue that includes all vendors in-house. That way, you’re assured of the quality of your guests’ experience in all areas. 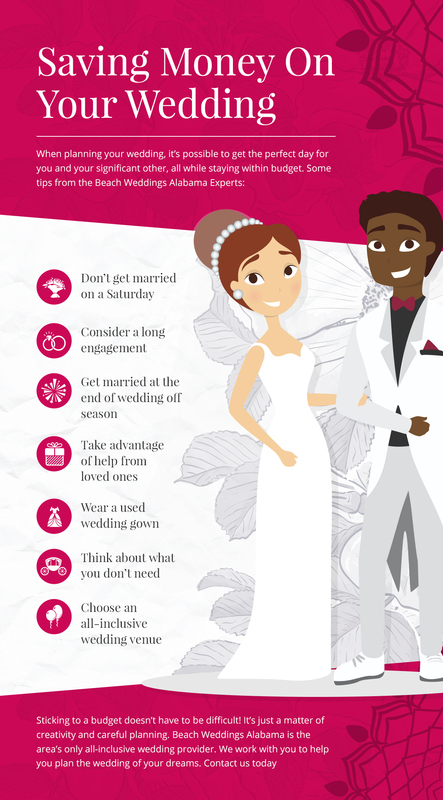 Beach Weddings Alabama is the area’s only all-inclusive beach wedding provider. Beach weddings are a beautiful wedding location that doesn’t require much in the way of decor. We work with couples to ensure they get the perfect wedding day for them, all within budget. Contact us to get started and see what we can do for you!